Since the late 19th century, many of Germany’s most renowned producers offer their finest wines at auction, where anyone can bid on some of the best Rieslings in the world. The VDP Mosel-Saar-Ruwer, also known as the Grosser Ring (“large circle”), was established in Trier in 1908. How does the Grosser Ring wine auction work? 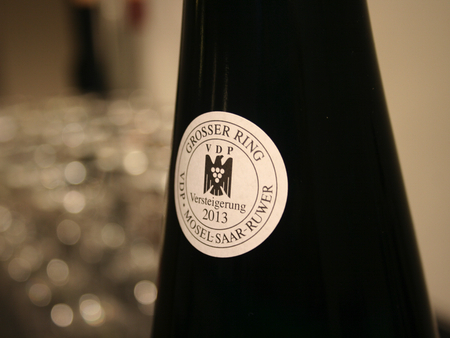 In Trier, the annual Grosser Ring wine auction is held in mid-September and is open to the public, with the possibility to taste the wines in the morning before the event. After the pre-auction tasting, the wines are then auctioned off in the afternoon in a so-called wet auction—i.e., the wines are served again while they are being auctioned. These are special lots of some of the best wines from the Mosel, Saar, and Ruwer. Therefore, they are not available via traditional sales channels. How can I bid on a wine? 1. Take a look at the auction list for 2014. 2. Choose your favorite wines and decide the number of bottles you would like to purchase out of these lots. 5. After the auction, the broker takes care of the shipment of your wines, which is no problem in Germany. International shipments are also possible. Are auction wines cheaper than normally sold lots? No, the auction offers rare wines of exceptional quality. So what you get are wines that are worth their price, as demand meets supply. Nevertheless, bargains are possible. The broker issues the invoice. Neither the broker’s commission of 5 percent nor the value-added tax is included in closing bid price. There could also be additional costs, such as for shipping. Your broker is your contact person. 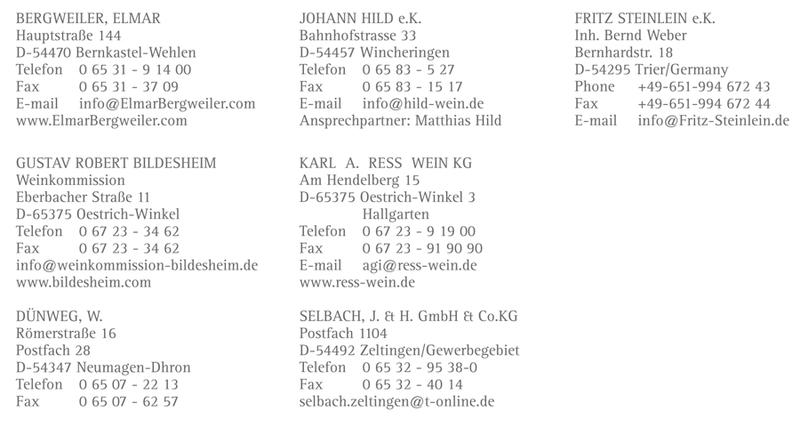 The following list covers all contact details of the accredited wine brokers in 2014. To be sure, please have a look at the official Grosser Ring and VDP websites. Inside the catalog, you will find a list of the brokers, too. Images courtesy of Florian Lauer. Florian Lauer is the fifth-generation grower and winemaker at Weingut Peter Lauer in Ayl on the Saar. He studied viticulture in Montpellier. In 1895, the Trier wine biweekly Weinmarkt talks about the auctions of bottled wines as well. In Trier, Max Ferd. 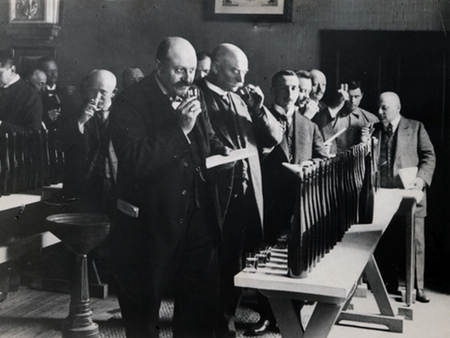 Richter, in Mülheim, offered 25,000 bottles of 1884 Mosel and Saar wines from leading producers. By the 1890s, the fashion was for young, brisk Mosel wine rather than mature ones. The Trier wine auctions allowed the buyer to taste the wines from Fuder beforehand. The wines had to be Naturweine (unchaptalized wines). In March and April, wine buyers flocked to Trier to attend the auctions, where Mosel wine from the best sites was sold by the Fuder (the traditional oak cask of the Mosel, officially holding nearly 1,000 liters) as eigenes Wachsthum, or “own growth.” These weren’t merely limited quantities of a few chosen sweet Rieslings, such as dominate today’s auctions in September by the Grosser Ring (“large circle”), the Mosel-Saar-Ruwer regional association of the Verband Deutscher Prädikatsweingüter, or VDP, the important national association of leading German wine estates. At the famous 1895 and 1896 Trier wine auctions, over 1,500 Fuder of the 1893 vintage were sold, the equivalent of almost 2 million bottles, which was still only a tiny percentage of the total production in the Mosel wine region. In the late 19th century, Mosel wines were specifically made to keep the pure Riesling aromas and a fresh, light prickle from residual carbon dioxide. They were consumed in their youth, unlike the renowned, longer-lived sweet Rhine wines, such as the coveted Auslesen from the Rheingau and Pfalz, which were often made from botrytized grapes. Mosels, with their pure Riesling scent and piquancy, represented the zeitgeist of modern industrial Germany with its faster tempo and newly affluent consumers. This period also saw the beginning of Jugendstil (“young style”), or Art Nouveau, in Germany. A number of buildings in the Mosel Valley, for instance, in the wine hub of Traben-Trarbach, and some of the most distinctive wine labels, such as Maximin Grünhaus and Immich-Batterieberg, date from this period.